Do you ever worry about needing a pit stop during a run? Are you concerned this will happen during the marathon? Read on for some helpful tips. You've decided to enter the Buffalo Marathon. You have completed your registration. You've received your confirmation email that you are entered. Now what? The bulk of your training is in the books. Here's how to make the most of all of the training you've done. We spend a lot of time running, stretching, strength training, and focusing on our eating to train for the race. However, do you give the same effort to your mind? Vicki is a distinguished athlete and international competitor, Vicki competed in the 1996 US Olympic Trials in the 10,000 run. She made her marathon debut at the 1999 Hong Kong Marathon, where she qualified for the 2000 US Olympic Marathon Trials. In 2001, she was invited to join the Fila Discovery USA training program, a program designed to develop American distance runners into elite marathon athletes able to compete with the best in the world. 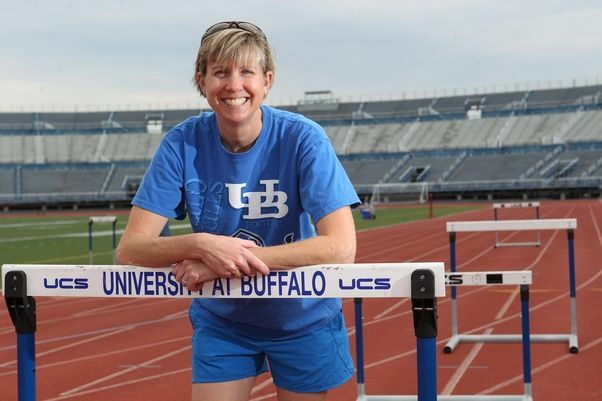 She has been a member of five USA national teams, including the 1993 World University Games and 1998 IAAF World Road Race Championship in Manaus, Brazil. Do you have days that you feel 'bored' with your running? You are not alone. Making a simple switch such as your training route, location, or running partner can make a big change in how you feel about heading out for your run. I have to admit, I am a creature of habit. I am perfectly content running the same loop every day. I'm fine running a long run on the treadmill. I enjoy being solo and within myself on a run. However, last week I had the opportunity to run at a park in North Carolina that I had not been to since I was in graduate school. I was reminded that enjoying a different training route is quite refreshing - even if your body is a bit tired! How can you switch it up your training routine and spice up your training? Below are some suggestions. 1. Try a different park. Talk with some running friends and ask for some new ideas of areas to run. I've lived in Buffalo nearly all of my life, and I am still finding new places to run. Search online for some ideas, post on Facebook for ideas. A simply change in scenery makes a big impact on motivation levels! 2. Run your loop in the reverse direction. If you have a normal running route for let's say, 6 miles... run it in the reverse direction (to clarify, I do not mean backwards!). You'd be amazed at how such a subtle switch really makes a big difference on how you view the run. I had a standard 5 mile run while in college for our easy days... We called it, "Airport Loop" aptly named because it ran around the airport. One day, I said, "Let's run Port-Air"... you guessed it, we ran Airport in the reverse direction. GAME CHANGER! 3. Try meeting a larger group for a run 1 day a week and follow with a breakfast (or dinner, depending on the time of day). Join a running club for a weekly training run. Run a workout on the track. Or if you run all of your workouts on the track, change and run on the road. The variety gives you something different to look forward to each run. 4. Get to the TRAILS! It's spring time and the snow is gone (let's hope), and now is the time to get into nature. Not only is it kind to your body to run on a soft surface, but it is a great way to strengthen the body. Trails require you to pay attention to your footing, forcing you to focus. Trails also require good strength in the feet, ankles and core. This is an added benefit! WARNING: pay attention for tree roots and other hazards on the ground, don't run trails alone especially if you do not know the trails, and always make sure you let someone know where you are in case of emergency. Explore and have fun. 5. Change your recovery day routine. Cross train with a different mode of exercise. If you always bike on a recovery day, try taking a spinning class. If you always hit up the elliptical, try swimming. Key - do a different mode of exercise and refresh the mind. 6. Get something new to wear! This is always a key for me. If I'm feeling tired or blah about my runs, I will get something new to perk up my body and mind. You don't need to take a second mortgage out! Something as simply as a new pair of socks, compression socks, or shorts will do! Of course, you can go for the full remodel, too! 7. Make a new playlist. If you run with music (note: please do not when running outside. It is a safety hazard! ), make a new playlist. 8. Run at a different time of the day. If you always run first thing in the morning, try an afternoon run, or vise versa. Now, some people can't change the time of day due to family obligations, work, or their body simply does not like the change. If you fall into that category, don't change the time of day you run. Also remember that your long runs should be done at the time of your marathon race start to ensure you are ready! Bottom line: A small change can bring a spark back to your stride! Explore and enjoy. And, Run strong! We're closing in on 6 weeks to marathon weekend. Sometimes motivation wanes in and out, but developing a strong sense of PURPOSE can help you keep your motivation. DID YOU KNOW THAT APPROXIMATELY 80% OF RUNNERS WILL MISS MORE THAN ONE WEEK A YEAR DUE TO INJURY?